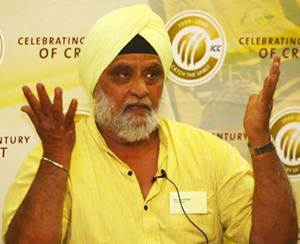 Former India captain Bishan Singh Bedi is well aware that it is a near-impossible task for him to beat Sneh Bansal in the Delhi & Districts Cricket Association’s presidential elections on December 30, but he is not ready to go down without a fight against the "shameful activities" of the current regime. "If you look from the perspective of corruption, how long will we tolerate what is going on at the DDCA? Is this kind of atmosphere that you want at a renowned Test centre of the country? At least we have been allowed to hold a press conference over here," Bedi said on a sarcastic note during a media interaction ahead of the association's elections. He addressed the media along with former India cricketers and Delhi stalwarts Madan Lal, Kirti Azad, Surinder Khanna and Clean Sports India convenor BVP Rao. Rao, who is fighting against corruption in the Indian Olympic Association, had come to "express his solidarity with Bedi and Kirti Azad" in their fight against corruption. Bedi was asked a number of questions on his meeting with Aam Aadmi Party (AAP) supremo and Delhi's CM designate Arvind Kejriwal, and the spin legend termed it as a courtesy visit. "What Arvindji is doing is at a larger scale, as corruption is an issue throughout the country. Ours is on a much smaller canvas but the basic goal is the same. To eradicate corruption which is deep-rooted," Bedi said. The a question on playing Delhi’s home matches in the Ranji Trophy at the Roshanara ground, Bedi said his fight is not against Gautam Gambhir but against the officials. "As a player, I can understand Gautam's desperation to win matches for his state but the communication between players and officials is zero. Does DDCA officials have the same desperation of winning the Ranji Trophy like the players? Are the voices of players like [Virender] Sehwag, Gautam being heard?," Bedi asked. The panel that will be fighting the current regime, which has the blessings of outgoing president and BJP heavyweight Arun Jaitley, knows too well that the chances of winning are bleak considering the need of "proxy voters" who rule the show at the DDCA. "Someone like Bishan Bedi don’t need to win by proxy votes. Our aim is to end the proxy culture at the DDCA. We believe that it will happen sooner or later," Azad, a former Delhi captain and member of India’s 1983 World Cup-winning team, said. "We want the general public to come and cast their votes. DDCA has become a place where one should learn how to run a fraudulent business. I have spoken to Mr Jaitley many a time. A Cricket Improvement Committee (CIC) was formed and only five cricketers were a part of it while rest were DDCA officials," fumed Azad. Azad also handed out a list of documentations including RTI queries and a reply from Minister of Corporate Affairs Sachin Pilot regarding the abolition of proxy system in DDCA. He has promised to look into the matter. However, Bedi couldn't give a convincing answer as to how one of the current senior Ranji team selectors, Aakash Malhotra, who is also secretary of the National Capital Territory CA which is the anti-Jaitley lobby, is part of the committee that has picked Haryana boy Navdeep Saini in the Delhi squad. "His voice was not heard but he protested," he said in defence of Malhotra, who is perceived to be close to current chairman of selectors and Bedi's bete noire Chetan Chauhan.